CHRISTIAN DAILY DEVOTIONALS (Insights on Daily Application and Popular Authors). Daily Devotionals are publications which provide a specific spiritual reading for each calendar day. Daily Devotionals are geared towards taking a closer walk with God on a daily basis. Some readers of daily devotionals make studying their devotionals the core of their daily existence. Some would not leave home without having read through the portion for the day, while others find a Quiet Time for it setting aside a specific time of the day to do this. There are quite a number of Daily Devotionals read daily by millions of people in the world. Below is the list of some popularly read daily devotionals. *John Piper Devotional to mention a few. Asides all the above-mentioned devotionals, there are also devotionals exclusively for Women which can also Walk, ad by the men who would love to understand the female mind. Do Daily Devotional have any benefit at all? They sure do! In fact, the benefits far outweigh the time spent studying. WE GET TO GIVE GOD OUR DEVOTION: God alone deserves our devotion. Reading daily devotionals avails us the opportunity of giving to God first instead of getting from Him. Psalm 29:2 talks more about giving unto God the devotion due unto Him. Spending time with God is essential to our walk of faith. WE GET DIRECTION FROM GOD: Daily Devotionals gives us direction from God for our daily lives, (Psalm 25: 4-5). When we sit quietly with the Lord, it gives Him the time and space to speak to us and give us the wisdom we need to make right choices. WE GAIN TH STRENGHT TO FACE TEMPTATION: It is very easy for us as human to fall into temptations, especially when we do not have the right backing of the scripture. We build strength on Daily Devotionals as our minds are kept focused on God. IT BRINGS OUR FAMILY TOGETHER: The family is the smallest yet strongest and most important unit of any society. When we gather together as a family each day to hear from God and learn from the personal revelations He gives to us, this builds us up as one and makes us look forward to the next day. – Know what each other’s likes and dislikes are. Written by Pastor Williams Folorunsho Kumuyi, the Founder and General Superintendent of the Deeper Life Bible Church popularly known as “Deeper Life”. This devotional guide is set out to provide spiritual nourishment for believers in and outside the Deeper Life Church, who truly seek God and desire a closer walk with Him. It is an extraction of God’s Word, purely undiluted. Joyce Meyer, the founder of Joyce Meyers Ministries is a woman who was saved by Grace and loving Mercy of the Father after years of sexual abuse and torture. Her ministry exists to share Christ through daily broadcasts, podcasts and conference events. In as little as ten minutes a day, her devotional will help renew your mind and discover that a life of Grace and Freedom after abuse is possible. The Open Heavens Daily Devotional is written by Pastor E. A. Adeboye, the General Overseer of The Redeemed Christian Church of God, one of the largest growing Christian Ministries world wide. The Open Heavens gives daily iinsights to the reader on having a steady and unbroken relationship with a God who is both loving and fearful. A life of holiness is possible and made known with Biblical truths from the scriptures used in the Open Heavens. Our Daily Bread is read by millions of people around the world and encourages them to spend time with God everyday. Their mission is to make life-changing wisdom of the Bible understandable and accessible to all. Their vision is to see people of all nations experience a personal relationship with Christ. Read the Daily Hope Devotional written by Pastor Rick Warren, author of The Purpose Driven Look Life online to recieve encouragement to live the life God has called you to. Daily Hope devotional will help get to where God wants you to physically, spiritually, financially, emotionally and relationally. It offers practical steps do reaching the goals God has for you. Written by John Piper, the Solid Joy Daily Devotional is one to look out for. John Piper is a Founder and teacher for desiringGod.org, an online Bible Ministry, and long-time Pastor of Bethlehem Baptist Church, Minnesota, Minneapolis. Kingdomnomics Devotional by Phil Wiegand. This devotional teaches you how to manage your God given gifts of Time, Talent and Treasure. How to properly exchange these gifts and use them to revere God. This devotional treats topics such as: How to give your heart to God, Ask God for insight and wisdom, Seek God diligently, Know God and his ways, Focus on Jesus, Follow God’s revealed will, Sow to the Spirit, Flow with the Spirit and Respond to the Spirit’s Promptings, etc. Dunamis Seed of Destiny Daily Devotional. 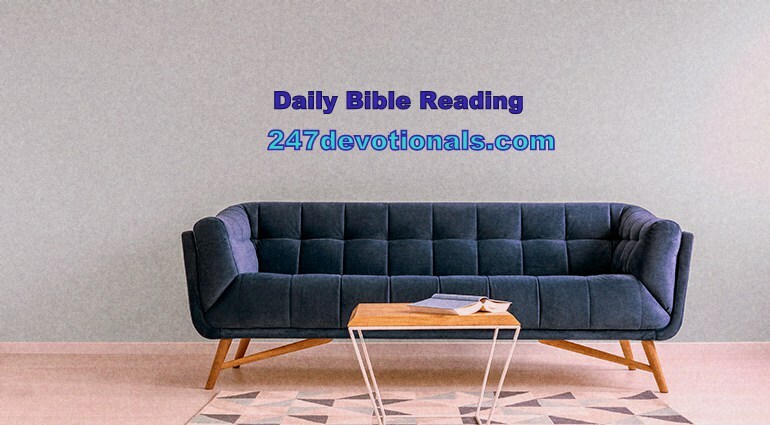 This devotional points you to God, letting God take control of your life, laws of God and Vision of God for your life. Topics such as He really does care for you, Be of good cheer, Throw open the door and No offense. With the calling from God to preach a message of undiluted grace and the desire to see his congregation empowered by God – Pastor Prince preaches the gospel of grace excluding it from the law of man. His teachings also point you to the finished work of Christ on the Cross of Calvary. His topics include Receive the word God has sent to heal you, Destroying the lifestyle of greed, Don’t look inside the ark and, Choose the good part and be blessed. This devotional shares the goodness of God’s grace, forgiveness and love. Makes the Bible understandable to everyone. Also emphasizes your relationship with Jesus and how to build it. With topics such as God in the details, Anywhere, The Art of forgiveness and Hurry not. Pastor Andrew teaches unconditional love and grace which he emphasizes in his daily devotional. He teaches the truth of the gospel and God’s unconditional love. Also, he helps you grow your relationship with God and Jesus. Some of his topics include Law of faith, Love and Trust, Worship is warfare and Servant power, etc. Pastor Graham believes the Bible is the powerful word of God, the Holy Spirit helps a Christian live a godly life and in the resurrection of Jesus Christ. All these you will find in his devotionals. He discusses topics such as: Love in action, All he requires, Know the Bible, What a Savior and The return of the Lord, etc. In his devotionals he preaches the message of hope and the principles of faith in God’s word. Also, he teaches about the love and peace experienced in holding on to God’s words. Topics such as He really does care for you, Be of good cheer, Throw open the door and No offense. Dr. Charles Stanley uses this devotional to teach the place of God and love in man’s heart, how to hunger for God. And cooperation with God’s timing. Using topics such as Our Heavenly Place: new Jerusalem, A heart for God, The gift of love and Loving God to explain. You can read a devotional from any denomination or man of God so far it edifies and brings you closer to understanding the scriptures. And you can find these devotionals on 247devotionals.com. There are a vast number of daily devotionals singularly for women and their walk with God. Daily Devotionals for women inspire, motivate and sustains them in times of both challenges and joy. They shed light on issues that touch every part of a woman’s life; from family, to work, to health, to relationship, to wisdom. There are varieties of Devotionals for women. * Transformation Garden, to mention a few. All these and many more are readily available for use both in hard ad soft copy formats.